The PC-3000 SAS 6 Gbit/s is a hardware-software solution intended for testing and restoring damaged HDDs with SAS (Serial Attached SCSI) or SCSI based interfaces. The PC-3000 SAS 6 Gbit/s coupled with the Data Extractor SAS forms the PC-3000 SAS 6 Gbit/s Professional System, which allows you to recover data from SAS or SCSI based HDDs. To repair these HDDs, you only need the PC-3000 SAS 6 Gbit/s – for data recovery you need both the PC-3000 SAS 6 Gbit/s and the Data Extractor SAS. 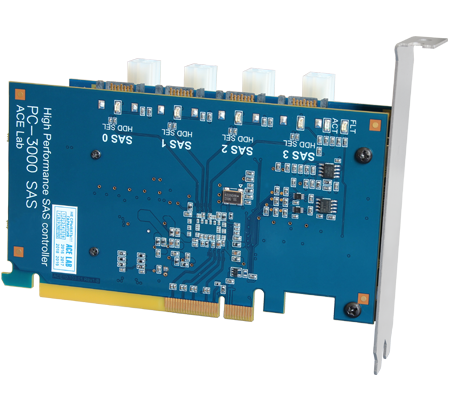 The new High Performance SAS controller PC-3000 SAS is a PC extension board for the PCI Express x4 bus that takes two adjacent slots which allows for working with four HDDs simultaneously. Four independent channels provide up to a 6 Gbit/s data transfer rate for each channel according to the SAS-2.0. The data transfer speed depends on the speed of the connected drives. 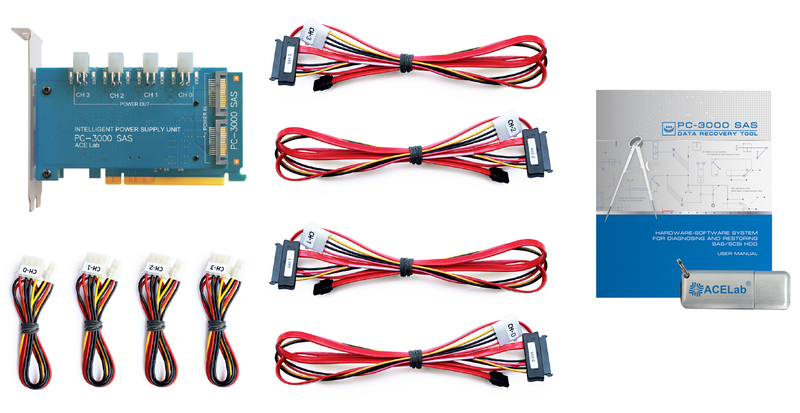 The PC-3000 SAS 6 Gbit/s controller allows you to connect SATA HDDs and SSD in read-write modes, test their surface, copy data, and make the image copies at maximum possible speed. The PC-3000 SAS 6 Gbit/s allows to launch the PC-3000 utility and Data Extractor tasks as separate OS processes. The "PC-3000 SAS Resource manager" software makes using the PC-3000 SAS 6 Gbit/s very easy and effective. It manages port and related process activity, controls the status of the ports, checks process conditions and kills processes if necessary. Once a process is started it can use any of the available ports on the PC-3000 SAS board. For instance, four processes can be used for every port or one process can use four ports etc. Power adapter: four-channel adapter with protection, the oscilloscope functionality and the measurement of the voltages and currents values. HDD connectors are internal. Supported HDD: from 18 GB to 10 TB; 3.5", 2.5"
A Hard Disk Drive (HDD) consists of three main parts: the Hard Drive Assembly, the printed circuit board and the internal software. If one of these parts is damaged, the HDD does not work. The PC-3000 SAS 6 Gbit/s System allows you to deeply diagnose HDDs, identify the cause of failure and fix the damaged HDD modules if necessary to get access to the user data. The PC-3000 SAS 6 Gbit/s solution tests, diagnoses, and repairs SAS/SCSI HDDs according to the SAS/SCSI HDD specification in standard (user) and technological (factory) modes. The PC-3000 SAS 6 Gbit/s software consists of a Universal utility aimed at general testing for of SAS/SCSI/SATA HDDs and Specialized utilities to work with SAS/SCSI HDDs in technological mode. To make initial diagnostics, the PC-3000 universal utility is launched. It diagnoses the HDD in user mode. If there are any HDD malfunctions, a special vendor-specific technological utility (intended for a specific HDD vendor) is used to repair the drive and gain access to user data in technological mode. All results can be saved into a file or database. All actions are recorded. 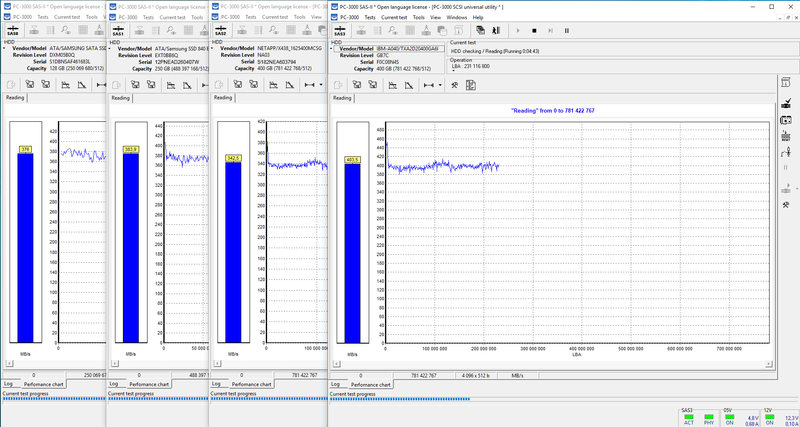 Testing for read, write, and verification are conducted by HDD performance testing coupled with performance charts. You can work with SAS HDDs with the PC-3000 SAS controller which has 4 independent SAS ports (ver. 2.0. 6 Gbit/s). 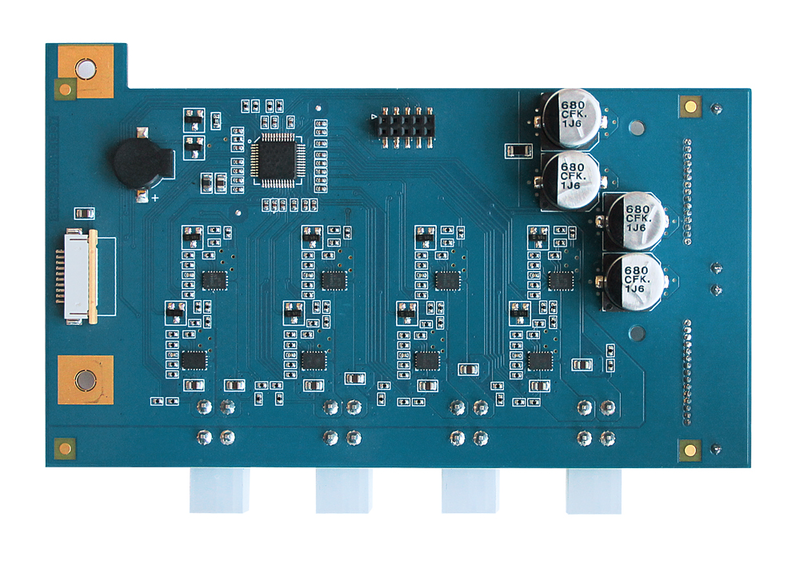 The 4-channel power supply unit allows to manage power of SAS HDDs, protects them from overvoltage and overcurrent, has the oscilloscope functions and measures the supply voltages and currents displaying them in the graph form. The Replication function allows both for creating an HDD image (full sector-by-sector copy) and for saving any HDD surface area to file on another HDD and writing saved data to selected media in various combinations between SAS, SCSI and SATA HDD/SSD drives. The Sector Editor provides the possibility to view and edit the defined surface areas. IBM, Maxtor-Quantum, Fujitsu, HGST and Seagate Special utilities allow to test SAS HDDs in technological mode, to check and recover the service information. 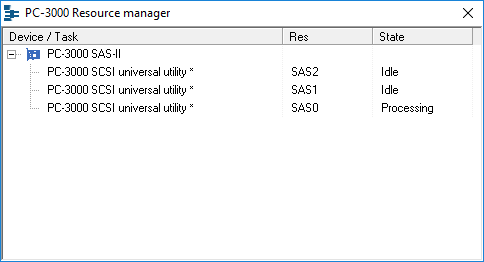 If any errors are detected, these utilities use additional Vendor code list. This list provides details about the root cause of the found error. In many cases this helps to exactly define all possible ways of repairing the HDD and recovering data from it. The Specialized utilities are used for testing and recovery of service information, modules, and configuration pages; recalculating (regenerating) of translator; testing of magnetic heads and surfaces with physical parameters; clearing of SMART, reset the counter of power cycles and working hours, HDD firmware uploading. You can work with SCSI HDDs with any SCSI controller – Host Bus Adapter (not included into the PC-3000 SAS Kit, and has to be purchased separately). With a SCSI controller – Host Bus Adapter, the functionality is the same as for the PC-3000 for SCSI except for some special functions, which are available only through their own SAS controller. 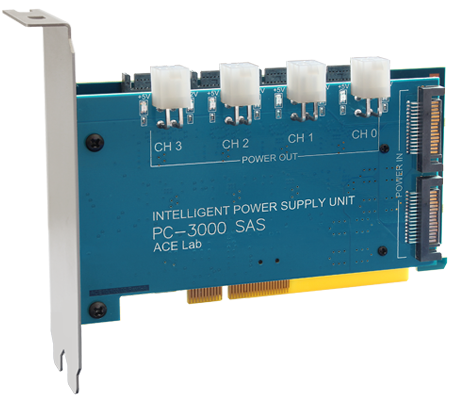 The PC-3000 SAS can work with any SCSI HDDs which have a parallel interface. In the same way as it is implemented for SAS HDDs, SAS/SCSI HDD testing can be conducted in the Universal utility (SCSI HDD general testing) and in the Specialized utilities (to work with SCSI HDDs in technological mode). 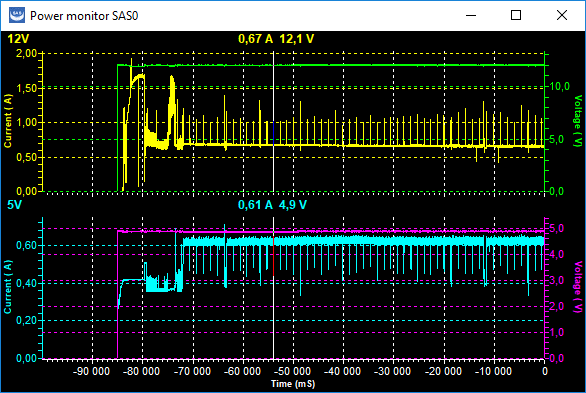 Operating with SCSI HDDs, the PC-3000 SAS controller works as a power supply adapter that allows to control the power supply of up to 4 SCSI HDDs. The PC-3000 SAS works with SATA HDDs and SSDs in read-write modes. It enables testing of the HDD surface, for example to screen or certify. You can test up to 4 SATA drives independently at the same time. Besides you can test other drives connected to the standard motherboard ports. The PC-3000 SAS can be used for replication operations (sector-by-sector copy creation) in different combinations of SAS, SCSI and SATA HDDs/SSDs. Data transfer is done at the highest speed possible for the HDD and is restricted only by the internal rate of data exchange between the disk surface and the internal disk buffer. The speed of reading and writing of SATA SSD can reach 600 MB/s. To recover data you should the PC-3000 SAS 6 Gbit/s Professional System which consists of the PC-3000 SAS 6 Gbit/s and the Data Extractor SAS. The Data Extractor SAS is a professional data recovery software that allows to recover data from SAS and SCSI drives connected to the PC-3000 SAS controller and the PC SCSI controller (which is not included into the PC-3000 SAS Kit). The Data Extractor SAS can recover data from both physically damaged HDDs and in the case of logical damaged caused by failures or malfunctions of the drive or operating system, incorrect user actions, or the effects of virus programs. The Data Extractor SAS supports the following file systems: FAT, exFAT, NTFS, EXT2/3/4, HFS+, APFS, UFS1/2, XFS, ReiserFS, VMFS, WFS0.x (for video recorders) and virtual machine images. If you deal with RAID, you may also get the Data Extractor SAS RAID Edition (or upgrade your DE to RAID Edition). The Data Extractor SAS RAID Edition is a professional solution for data recovery from damaged RAID storage based on SAS (Serial Attached SCSI), SCSI, SATA interfaces and supporting the following configurations: Stripe, Mirror, JBOD, 1E Offset, 1E Adjacent, 4, 5, 5E, 5EE, 6, 6 Adaptec, any combined (10, 50, 51, 60...), and table-defined custom levels, as well as WSS (Windows Storage Spaces), ZFS RAID-Z, BtrFS RAID, Apple Fusion Drive (HFS+, APFS). August 8, 2018 The new versions of PC-3000 Express/UDMA-E/Portable Ver. 6.5.14, Data Extractor Ver. 5.8.5, Data Extractor RAID Edition Ver. 5.8.5, PC-3000 SSD Ver. 2.6.5 are available now! December 14, 2017 The new version of PC-3000 SAS Ver. 6.4.14 is available now! The head map detection option for some FW versions has been enhanced.